Indulgence Items add to your memorable getaway because they say “I love You”! To make your stay more memorable, you may wish to add one or several of our unique indulgence items to your stay. 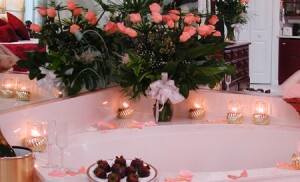 Champagne, Romance & Roses – #1 BEST Indulgence! 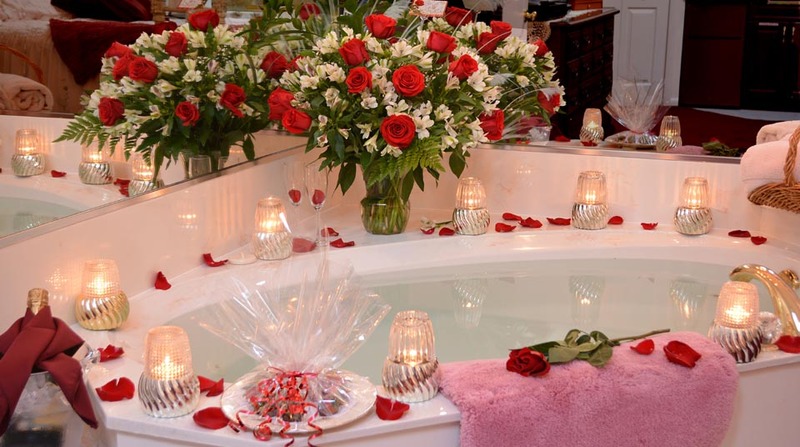 Finally, Soft Background Music – all set up to “WoW” your special someone when you arrive! Note: Roses are “Red” unless specified otherwise. Above roses are pink. If you prefer non-alcoholic bubbly, package price is $175 + tax. Just advise us when you reserve. An Optional Upgrade – by advanced reservation – $58 to $68 per couple per morning. 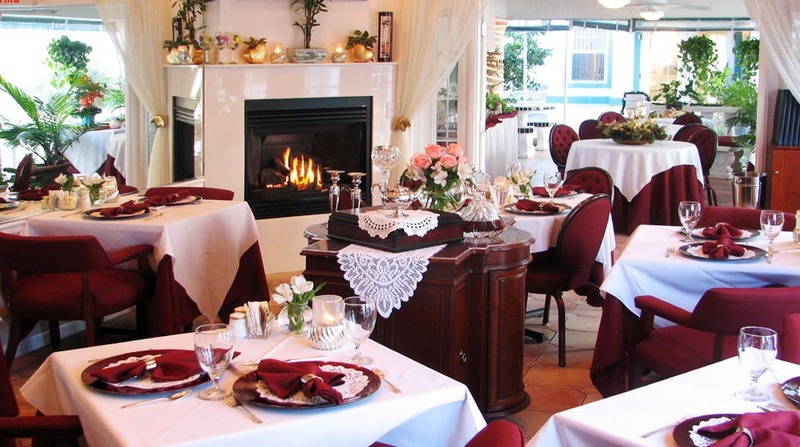 Most importantly, this unforgettable indulgence is served on individual tables with pressed linens and candlelight and also soft Mediterranean music in the background. Value – PRICELESS !! Please Note: Since we do not operate an actual restaurant here, we do not keep product on-hand. For this reason, everything is cooked, baked & purchased especially for you, and because of this, we require a 1 week minimum notice for those wanting to add this scrumptious option. Allergy Information: All our recipes use Whole Milk, Butter and also Eggs. We do not use margarine, egg substitutes or artificial sweeteners. *Truvia and also *Splenda packets are available for your coffee. Sorry, … we do not offer “gluten free” or “dairy free” options. And an Array of Gifts. An extraordinary package for that Extraordinary, Special Person in your life! and indulge in the scenery! Just bring your flip-flops & you’ll have everything you need for an exciting day at the beach or under a shade tree at one of our local state parks! Toni’s Famous Home Made Potato Salad – said to be the best on the planet! A lovely indulgence for an afternoon of good food, love & laughter. We supply the dishes, silverware, napkins and tablecloth so, all that is missing is “You”!